The genocide of Jewish and non-Jewish civilians perpetrated by the German regime during World War Two continues to confront scholars with elusive questions even after nearly seventy years and hundreds of studies. This multi-contributory work is a landmark publication that sees experts renowned in their field addressing these questions in light of current research. 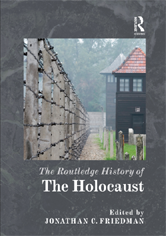 Serving as a comprehensive introduction to the history of the Holocaust, this volume also adds depth to current debate, both geographically and topically, assessing the Final Solution as the German occupation instituted it across Europe and covering issues which have previously been under-investigated, such as the problem of prosecuting war crimes, gender and Holocaust experience, the persecution of non-Jewish victims, and the Holocaust in post-war culture.